Ever have a time in your life where you took a big risk? A leap of faith? I’m in the middle of one of those “leaps” right now. But have you ever felt opposition hit you head on as soon as you take that faith step? Sometimes I wonder if the moment we take that first step, a big, flashing sign goes off in hell reminding Satan to try his best to keep us from taking one more step. It can be physical opposition or it can be mental. Sometimes our minds can be our own worst enemy when it comes to living a life by faith. Have I mentioned before I have some of the best, Godly friends in the world? I can’t imagine doing life with out such people to turn to. So I began really thinking about faith in my every day life and started thinking of “leaps” we take every day. You may not fervently seek God in prayer over every little thing you do in your day, but just leaving your home each morning is a step of faith if you really think about it. Yes, some steps and leaps are bigger than others. But to God, THEY’RE ALL THE SAME! Faith as small as a mustard seed…that’s really small in case you were wondering. Like minuscule. And I’ve got at least that much faith. I wasn’t saved at the age of 4 and have grown up in church and ministries to not at LEAST have that much faith. So then I began thinking to myself, if I don’t question those little faith steps every day because I trust so wholeheartedly in my faith, then why am I even questioning the big leaps? I have enough faith to take on the biggest of leaps!! And that’s when Facebook spoke to me. Has that ever happened to you? Just when you need it most, someone posts something or shares something that is just what you need to hear (or read). Some people might be opposed to social media, but I kind of love it for reasons just like this. It really hit me then; I not only have enough faith to take the biggest of leaps and not worry about failing, but I serve a God who is bigger than EVERYTHING! So be encouraged in His word and in your faith. You might not think it’s very big or that you can stand up against whatever you might be facing, but you can! It takes faith to jump from a diving board. Oh boy do I know that to be true…you’re talking about a girl here, who can’t stand the thought of water deeper than her 5’3″ height – although I love snorkeling, so go figure that one. Back to the diving board. If you are on the diving board and getting ready to take that big leap, and of course the only way to do it is to do it BIG, so you decide to do a cannonball. You take a step back before taking off, jumping, and tucking your knees to your chest. That cannonball is about to be the most successful cannonball ever as long as you don’t let fear take hold of you. When you let fear take hold in the middle of that cannonball, you let go of your grip, and most likely end up in a painful belly flop (or side flop, or back flop, but a flop none-the-less). What does all of that mean? 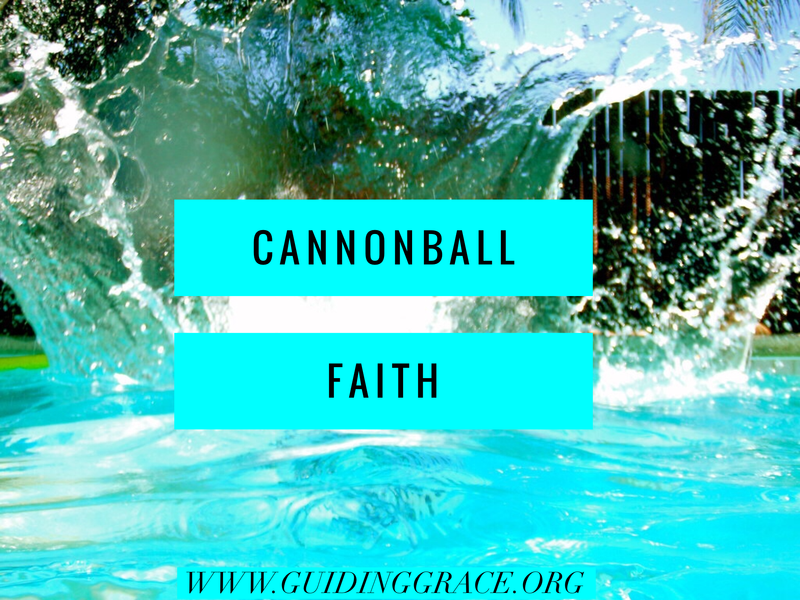 Have CANNONBALL FAITH!!! An all-in mentality. Let go of your fear and take hold of your faith and before you know it, you won’t just be doing cannonballs anymore, you’ll be stepping out and doing your own Peter walk on the water! !